A responsive Wordpress E-Commerce site built for a York based butchers shop and meat wholesaler. The Butchers Block are a meat wholesaler based in York, who also have a fantastic shop that sells so much more than meat; they are a family run business and really passionate about what they do. We've worked with them for a number of years, initially upgrading them to a scratch-built, fully responsive, brochure-style site with a mobile-first approach to media queries. This was then expanded to a database driven version to catalogue their product range, making extensive use of Object Oriented PHP. In 2016 The Butchers Block made the decision to start offering online reservation and delivery options as well as online payments; we were tasked with upgrading the site to suit these requirements. To offer a cost-effective solution which would allow quick deployment of future features; we decided to port the existing site into WordPress. This allowed us to take advantage of its WooCommerce plugin to quickly establish a full E-Commerce experience and take online payments via the PayPal payment gateway. As with all our dynamic sites, the previous iteration of the Butchers Block website was built using a MVC software architecture, allowing us to smoothly transfer over custom functions with minimal effort, and import the existing product database. We then worked with the client to consider the customer journey through the site, and adjust their product options to suit online purchasing. 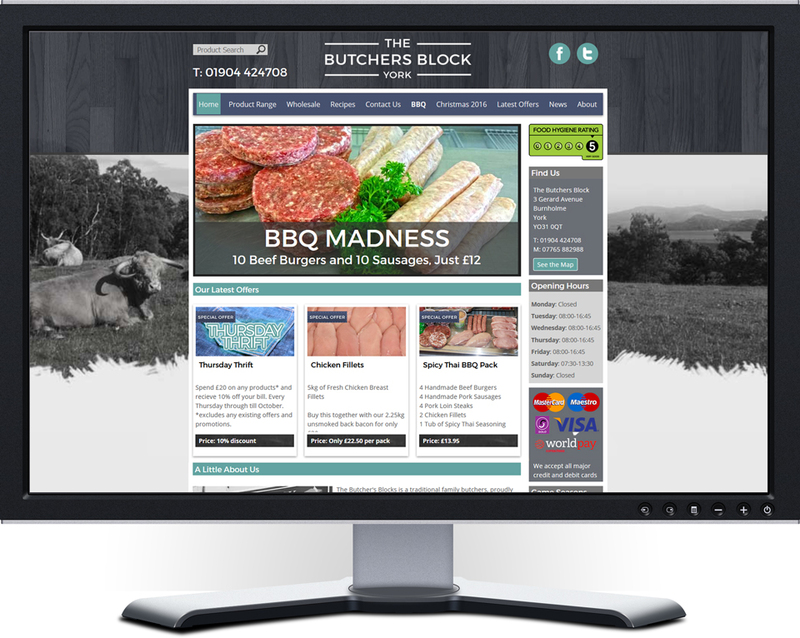 Having recently launched the site, prior to the Christmas period, there has been positive feedback from the Butchers Block and its clients, which has translated into a large number of orders being placed online as well as a 100% increase in visitor numbers compared to the same period in the previous financial year.